For the women of Saint Mary’s College, this statement rings just as true today as it did in 1844 when the college was founded by the Sisters of the Holy Cross. Saint Mary’s is a place where women can grow in their Catholic faith and make a difference in the world. With a small student body of about 1,500 Smicks (SMC chicks), Saint Mary’s has a unique community feel. You feel like you’re instantly part of a sisterhood of powerful, creative and caring women. 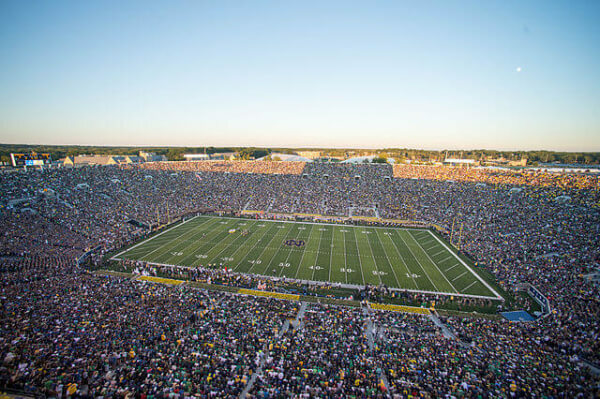 Across the street, the University of Notre Dame expands the opportunities for Saint Mary’s students, with classes, sporting events and teams, clubs and organizations. Being in the SMC community automatically links you to the community of Irish men and women. 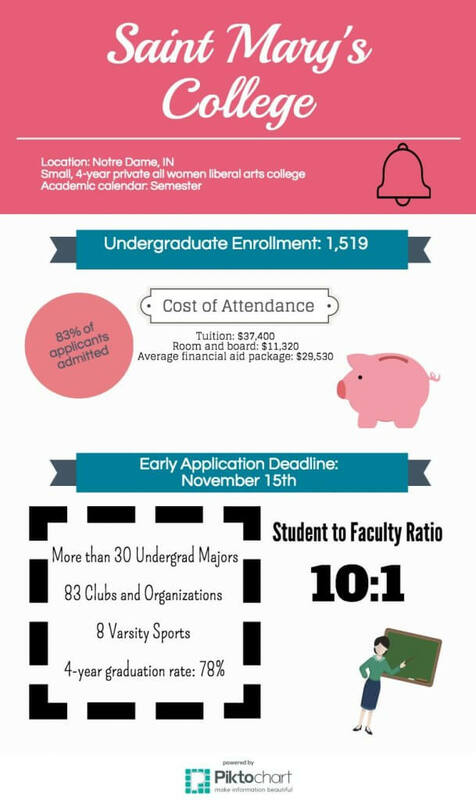 But what really sets Saint Mary’s apart–besides being an all-women’s college–is the influential students who go here and have come before you. Whenever you see someone with the gorgeous Saint Mary’s class ring, you instantly form a bond based on mutual love for SMC. There’s just something special about the belles of SMC under the bell tower. Saint Mary’s is a pretty work hard, play hard place. You have to pay to play. Sneaking boys in the dorms past parietal hours is the biggest thing that gets girls in trouble. Seeing as it’s an all-women’s college, straight women who want to feel some extra love have to go across the street to Notre Dame or to Holy Cross College. 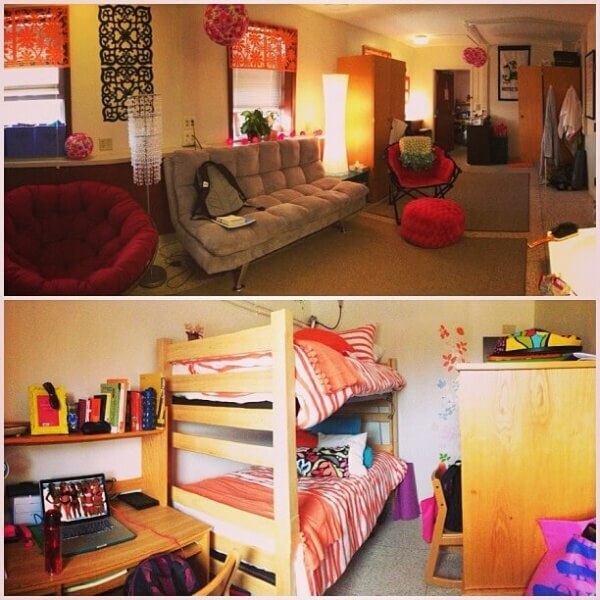 Le Mans and the four other residence halls on campus make SMC feel like a home away from home. 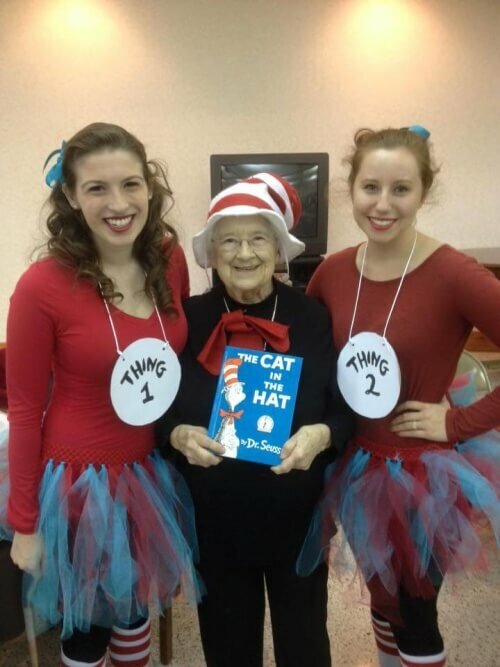 No Greek life means each hall has a sense of spirit and community. Living in dorms for three years means you basically have a sleepover every night with your best friends in unique and historic dorm rooms, some even having fireplaces and huge walk-in closets. There’s no doubt that football Saturdays are just as important for Smicks as they are for Domers. Even if you’re not into football, the tailgates at SMC and ND are unforgettable. Students come out to eat some amazing food, listen to the band of the fighting Irish and bagpipe players and more. There’s nothing quite like Irish spirit. Sharing the campus with the Sisters of the Holy Cross is the greatest honor and blessing for students. As the founders and sponsors of our college, the sisters live on campus and form relationships with Saint Mary’s students through a club called Friends with Sisters that partners students up with a sister. Just one example of how important SMC history is to the women who go here. Have you ever seen a ring quite so beautiful? 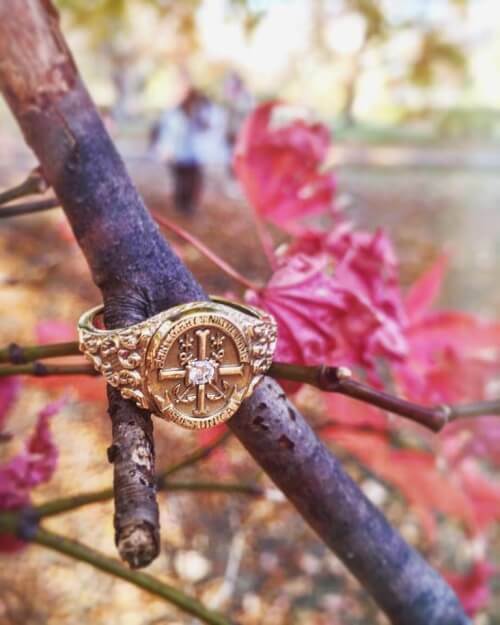 The SMC ring is a symbol that connects students and alumnae to each other in a special way. You’re bound to see hundreds of unique “ring pics” on Instagram from your friends once junior year rolls around and belles can finally get their “ring by fall.” Who needs an engagement ring by spring anyway?! To help form relationships between SMC, ND and Holy Cross College, Saint Mary’s forces all freshmen to attend Domerfest, a huge event at ND during welcome week. You’ll laugh at the awkwardness of Domerfest for years, probably with some of your best friends that you met at the event. Alaina is a junior at Saint Mary's College studying English Writing and Communication Studies. From the warm and exotic state of Wisconsin, she is a professional shower singer, an ambassador for The Elephant Pants, and enjoys playing her ukulele.